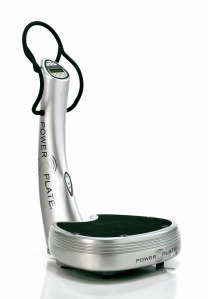 Awhile back I tried a Power Plate workout. I liked it, but didn’t keep up the training. Perhaps I should have: there’s research that shows that it can improve athletic performance (although only immediately after standing on the vibrating platform and for only a very short period of time–say for about the one minute after you’ve stepped off the machine).